Deliciously full and sensual lips are relatively uncommon, which could be why they are so desirable. Over history, women have used a variety of resources to color and highlight their lips. Now, if you want a perfectly puckered pout, lip augmentation with fat transfer could be the answer. Research shows that by extracting excess fat from another area of the body and injecting it into the lips, patients can have permanent lip augmentation with more noticeably plump and shapely lips. Fat transfer is one of the most commonly used techniques for lip augmentation. This refined technique can improve lip symmetry, fullness, size, smoothness, and shape to give you more attractive and luscious lips. For the procedure, fat cells are first extracted from a fat-rich part of your body, such as your buttocks, abdomen, or thighs. The fat is processed and then injected into the lips. Over the next few weeks, the injected fat triggers growth in the lips to enhance their appearance. The fat then settles into place giving the lips a more desirable shape and fullness. Fat transfer differs from other lip augmentation techniques in several ways. 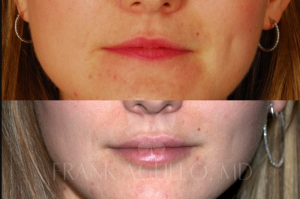 Compared to the technique of using dermal fillers for lip augmentation, fat transfer tends to have more natural-looking results. Additionally, fat transfer results are permanent. Up to three initial treatments may be needed to achieve the desired results, but after that point, no further treatment is necessary. In contrast, dermal fillers provide only temporary enhancement and must be touched up as often as every six months. While the fat transfer procedure may have increased bruising and swelling and may take longer to reveal the results, its permanent and natural-looking results make it a sensible and preferable choice for many lip augmentation candidates. Lip augmentation with fat transfer may be the ideal solution for you to achieve the beautiful and luscious lips you seek. To request more information, schedule your consultation with one of our plastic surgeons at Southwest Plastic Surgery. Call (915) 590-7900 or contact us online at your earliest convenience.